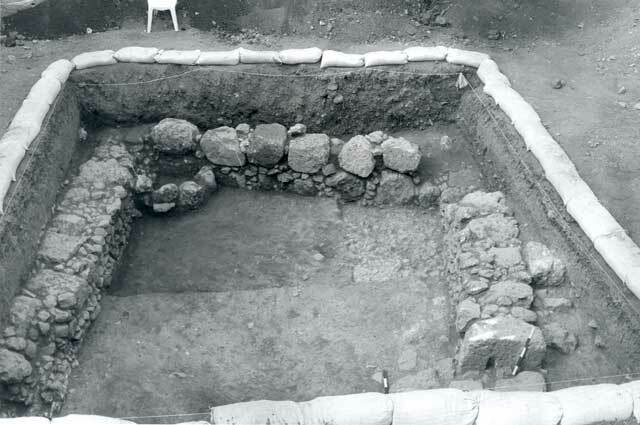 During August 2003 a salvage excavation was conducted in the Sulam village (Permit No. A-3968*; map ref. NIG 231655/723425; OIG 181655/223425). The excavation, carried out on behalf of the Antiquities Authority and financed by Z.A. Yusuf, was directed by B. Hana, with the assistance of V. Essman and V. Pirsky (surveying), L. Porat (pottery restoration) and H. Tahan (drawing). One square was opened at the southern end of the village. Remains of a room whose fieldstone-built walls (W10–12; Figs. 1, 2) were founded on bedrock and preserved one–two courses high, were exposed. 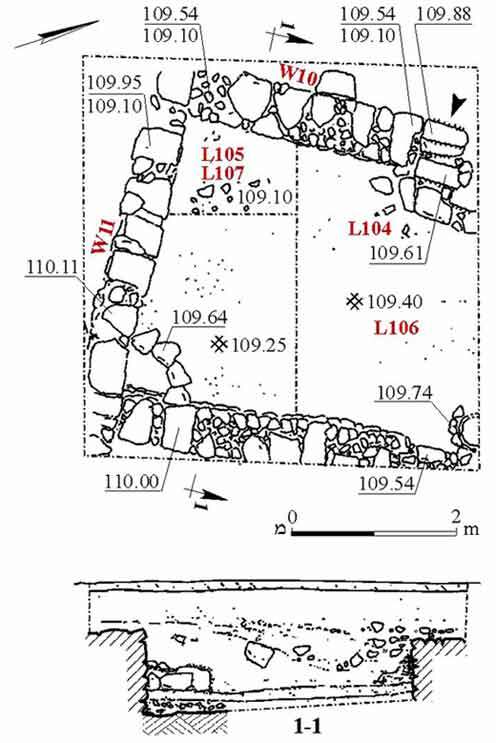 The eastern and western walls (W10, W12) were lined with small fieldstones on the interior. An entrance in the northern part of W10 was survived by the southern door jamb and threshold, which was a large limestone block. A limestone-built step was set inside the entrance, on the floor of the room. The floor of the original room (L105) was laid on bedrock and abutted the three walls. It consisted of mud-brick material, gravel, soil and potsherds that dated to the Early Islamic period, including a cooking bowl (Fig. 3:3), a jar (Fig. 3:4) and a jug (Fig. 3:6). Another floor (L104, L106), c. 10 cm above Floor L105 was composed of mud-brick material, ash, small stones and potsherds from the Early Islamic period, including a bowl (Fig. 3:1). This floor abutted the walls of the room as well and was overlaid with remains of hearths with ash, as well as a tabun (diam. 0.4 m) that was embedded in its northwestern corner. A semicircular installation (diam. 0.6 m) in the southwestern corner of the room consisted of limestone pieces that were also incorporated into the floor. On the later floor was a layer of fill composed of soil, ash, small fieldstones and potsherds from the Early Islamic period, including a cooking bowl (Fig. 3:2), a jar (Fig. 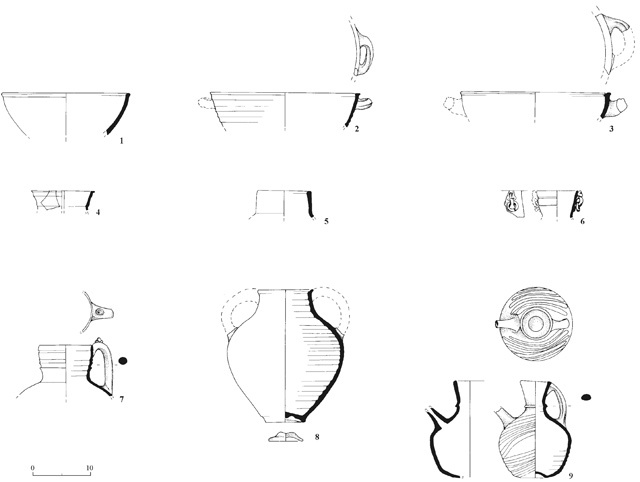 3:5) and jugs (Fig. 3:7–9). The pottery assemblage was noted for the presence of buff-ware jugs and the absence of glazed bowls; hence, the assemblage should be dated to the beginning of the Abbasid period.